Thanks to my dear friend, Jenn, I was able to get my hands on a bag of the latest Holidrizzle flavor from Angie’s Boom Chicka Pop Kettle Corn line. Because, I never did get my hands on a bag around here. I just couldn’t find it. So, up until then, I figured the Angie’s Boom Chicka Pop Holidrizzle Pumpkin Spice Kettle Corn was simply a rumor. But, I have friends who are beyond aware of my obsession with pumpkin…EVERYTHING (save pumpkin pie…gross!). Yep. I’m one of those pumpkin freaks. But…even more important, I am a popcorn freak. It is, by far, my favorite snack. EVER! I love popcorn and could eat it every day. And when Angie’s came along with their extensive lineup of Boom Chicka Pop popcorn flavors…life got a little sweeter for sure. And then…one winter season around Christmas…the first of the Holidrizzle bags arrived. And I was hooked for life. The original two flavors: Dark Chocolatier Sea Salt and White Chocolatier Peppermint – and, trust me, they were beyond addictive. I could eat an entire bag if I didn’t dole out serving sizes to nosh on. They are that amazing. So, when summer faded into fall and the first of the Pumpkin Spice treats began emerging (I think everyone waits on Starbucks and the latte). And I had heard of this new Holidrizzle flavor from Angie’s. But, all I could find out here was the Candy Corn flavor. I don’t like candy corn, so I wasn’t interested. I was, however, beyond interested in the Pumpkin Spice variety. And Jenn picked me up a bag. And last night…after my delicious dinner…it was dessert. Angie’s Boom Chicka Pop began in a garage in Minnesota where Dan and Angie Bastian wanted to do something fun with their kids, while showing them the value of hard work. And, from that decision, their amazing kettle corn recipe emerged into a business, with product being sold at local events. Soon, even the NFL team, the Minnesota Vikings, took notice. The rest was history. The Boom Chicka Pop kettle corn recipes are all non-GMO and certified gluten-free. Every product. All of them. Every variety is a better-for-you snack with simple ingredients, calorie transparency, and great taste. It pairs well with EVERYTHING and ANYTHING. Trust me. I ate mine after eating Chinese food. HA! It doesn’t get much better than small-batch popcorn being made with simple ingredients and wowing even the casual popcorn lover with flavor and taste. And…she’s right. So, if you’re “not a fan of pumpkin” then you will actually like this. Because when I tested it, I got the warm fall spices (cinnamon, nutmeg…and then the sweetness from the very light drizzle that some of the pieces were treated to. It was definitely delicious. And I would certainly eat and eat and eat these quite happily…but if you are one who wants that powerful pumpkin flavor, this is not the mix for you. Not at all. But, if you like a pumpkin spice latte…that’s what this is. That’s the flavor. Delicate spices…but not really pumpkin. Just…pumpkin-y…without any real…pumpkin. It’s a gentle, generous flavor and it blended so well with the sweet and salty nature of the kettle corn. Beyond addictive for sure. Let’s look at ingredients, shall we? Angie’s Boom Chicka Pop Holidrizzle Pumpkin Spice Kettle Corn is made with cane sugar, popcorn, sunflower oil, palm and palm kernel oil, whey powder, nonfat milk powder, spices, sea salt, natural flavors, and soy lecithin (emulsifier). This popcorn is certified gluten free. And certified tasty. As for nutritional information, Angie’s Boom Chicka Pop Holidrizzle Popcorn is not bad…or a drizzled treat. A serving of this popcorn is 1-1/2 cups (28 grams). There are about 4.5 servings per bag. In this serving, you will be consuming 140 calories, 8 grams fat, 3 grams saturated fat, 0 grams trans fat, 0 mg cholesterol, 80 mg sodium, 18 grams carbohydrates, 2 grams fiber, 11 grams sugars, and 1 gram protein. Not a filling treat, but then again, it doesn’t need to be. Careful though…it’s addictive. While I think a part of me expected a little more of that BOOM…PUMPKIN flavor in Angie’s Boom Chicka Pop Holidrizzle Pumpkin Spice Kettle Corn, it doesn’t deminish the fact that this popcorn is awesome. It’s light, salty, sweet, and tastes like fall. If you are a snob about your pumpkin flavor, this may not be the product for you. But, if you love something that screams pumpkin spice flavors…with a little drizzle of sweet heaven…then I encourage you to purchase a bag of this popcorn and eat it at your own risk. Trust me, it won’t last long. Thank you, thank you, THANK YOU to my local Kroger. Because after spending a majority of the fall searching high and low for a few specific products released with a pumpkin flavor…I found very few of them. Like…Peanut Butter & Co. Pumpkin Spice Peanut Butter. Never did find that, and refused to pay more on shipping than I would to order just one jar. That’s just one example. I still haven’t found it and probably won’t at this point. And I thought that was going to be the case with the Barbara’s Gluten Free Pumpkin Puffins Cereal too. I really did. First of all, when anything seasonal comes out (ie: pumpkin flavor), it is always for a limited time. And that means…you find it as soon as you can and you buy it…no hesitation. 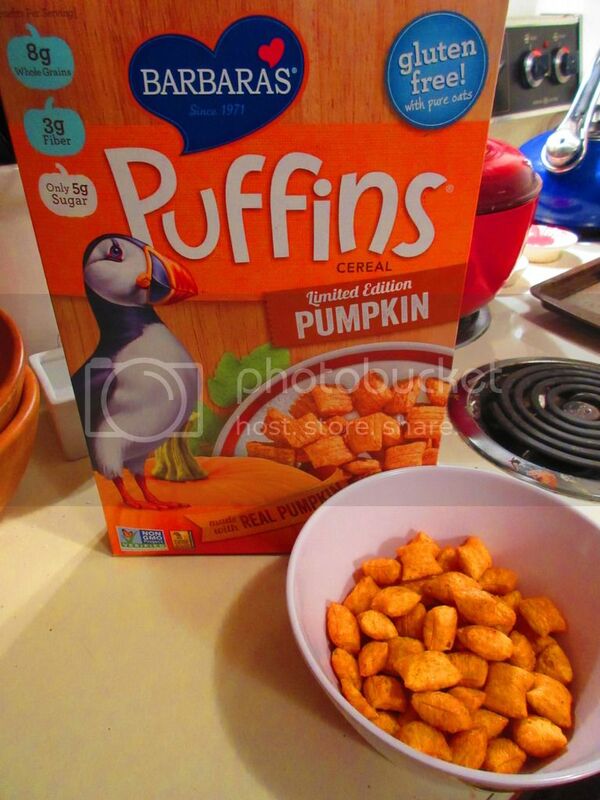 Well, I was lamenting that all my usual suspects (my natural food stores in town) all had the regular (gluten free) Puffins cereals by Barbara’s…but no one had the Pumpkin Puffins. And then, one day while winging past an end cap of an aisle I never at, there was this HUGE display of Barbara’s cereals. And right there…front and center…were the Gluten Free Pumpkin Puffins. HAPPY DANCE!! (Seriously, the other grocery shoppers may never be the same). Barbara’s was founded back in 1971, but 17-year-old Barbara Jaffe. In the Bay Area, Barbara was striking out, and discovering her her love for real food, and opened up a bakery in Northern California. Her plan was simple: make wholesome food taste incredibly delicious. Using whole grains and oats, she began her business with bread, and soon, her business went from a small storefront start-up to a thriving wholesale business. Now over 40 years later, the product line has grown to include cereals, snack bars, cookies, and cheese puffs…among other things. And, true to Barbara’s initial business plan, the company still upholds the commitment to create simple, wholesome and delicious products with the most honest ingredients. So, the weird thing is, in the four years I have been gluten-free, I haven’t tried any of the Barbara’s gluten free products. Not even the original Puffins cereal. Go figure. I have no idea why…but…true story. So, this morning when I opened the box of Barbara’s Gluten Free Pumpkin Puffins to eat before heading to spin class, I wasn’t sure what to expect. I tore into the bag and dished up a serving of this cereal. I love that this cereal is made with whole grains. I love that this cereal has only 5 grams of sugar per serving. I love that this cereal has just the right level (and this coming from a pumpkin-everything advocate) of pumpkin. I love that this cereal has the right amount of sweet and spice, with nothing outdoing the other. It’s a perfect pumpkin balance, for sure. If you want to know what fall tastes like…just pop a handful of these little delights. Seriously. I love the crunchy texture. The amazing flavor. And, best of all, this cereal is actually made with real pumpkin. No fake stuff here. I was beyond impressed. And, you better believe I won’t shy away from the gluten-free cereals that Barbara’s offers anymore. So happy! Speaking of real pumpkin, let’s take a look at everything that goes into Barbara’s Gluten Free Pumpkin Puffins. This cereal is made from corn, whole grain brown rice, cane sugar, whole grain pure oats, fructan (natraflora prebiotic dietary fiber), unsulfured molasses, oat hull fiber, calcium carbonate, pumpkin, sea salt, natural flavor, annatto (for color), cinnamon, vitamin C (ascorbic acid), iron (ferric orthophosphate), tocopherols (antioxidants to maintain freshness). This cereal is gluten-free, non-GMO verified, vegan, low in fat, low in sugar, made with whole grains, and made with real pumpkin. As far as nutrition information goes…you’ll love this. A serving of Barbara’s Gluten Free Pumpkin Puffins Cereal is 1 cup (30 grams), and there are about 9 servings per box. A serving will provide you with 110 calories, 0.5 grams of fat, 0 grams saturated fat, 0 grams trans fat, 0 grams monsaturated fat, 0 grams polyunsaturated fat, 0 mg cholesterol, 75 mg sodium, 80 mg potassium, 25 grams carbohydrates, 3 grams fiber, 1 gram soluble fiber, 2 grams insoluble fiber, 5 grams sugars, and 2 grams of protein. It’s nutritious and delicious! For being my first Barbara’s product to try, the Gluten Free Pumpkin Puffins Cereal really hit it out of the park. I am excited at the prospect of trying out more of her gluten-free cereal line-up to see how they measure up. But with a great ingredient list and amazing nutritional value…this is definitely a cereal I would easily add to my pantry every week. Just…wow! Delicious. Pumpkin-y goodness. It’s a sweet taste of heaven in a pumpkin spiced package that’s perfect for your morning cereal bowl. I have to give major kudos to the kitchen giant that is Williams-Sonoma…aka…that store that is like crack to me…really out of my price range, but, dammit, I keep going back to it. HA! When Cup4Cup was first introduced to the gluten free market, it was done through Williams-Sonoma stores. And that was where I first bought it…for a price tag as extravagant as the one you see attached to this little package of bread mix. But…sometimes…the price is worth the product. Last year, Williams-Sonoma unveiled a plethora of holiday mixes and even offered a gluten-free version of some of them. One such product was the Gluten Free Spiced Pecan Pumpkin Quick Bread mix. When I saw it, I didn’t care that it was $15, I took it up to the register and purchased it. The reason I mention Cup4Cup above is that this quick bread mix is made with Cup4Cup Gluten Free flour! I took it home and put it in my pantry, excited beyond belief to have this bread mix. And then never got around to making it. But the great pantry purge is on…and this was still just sitting there…begging to be made. Last night, while The Voice was on television, I set out with a mission. Not just to bake cookies (which I did), but to make this bread. I don’t know why I waited so long. It was SO easy. In a large bowl, I simply poured the Williams-Sonoma Gluten Free Spiced Pecan Pumpkin Quick Bread mix and added 1 stick of melted vegan butter, which I let cool slightly, 1 cup water, and 2 eggs. That was it. Easy-peasy. I gave it a stir until it was smooth and blended…then poured the batter into a greased bread pan. Into a preheated 350°F oven it went for around one hour. The wait was difficult because, as it baked, it smelled amazing. I was doing my PT stretches and practically drooling. Seriously. And when the timer finally went off and I pulled the loaf pan from the oven, it was all I could do to wait the 10 minutes for it to cool before turning it out and being able to at least sample a piece. I did manage to wait, but the minute that timer went off…it was game on. I sliced off the very end of the bread, loving how moist and rich it felt as I sliced with a sharp knife. I could see the scattering of pecans throughout the loaf. Not only did it smell amazing, it looked amazing too. But the test always comes with the first bite. WOW. Moist, soft, packed with flavor. It tastes like fall…giving off hints of cinnamon, nutmeg and ginger. Every bite was a delight. No joke. I loved the speckled bits of pecans throughout, which gave the moist and soft slice a bit of texture as well. The crust on the outside got to this beautiful golden shade and, while it is a pumpkin bread, it wasn’t just loaded with the pumpkin flavor. I think that’s a bit of a disappointment for me, but the spices really shine this way, and that’s not such a bad thing. It’s now dessert and possibly the base of a French toast this coming week. Seriously…I am so in love with this bread. 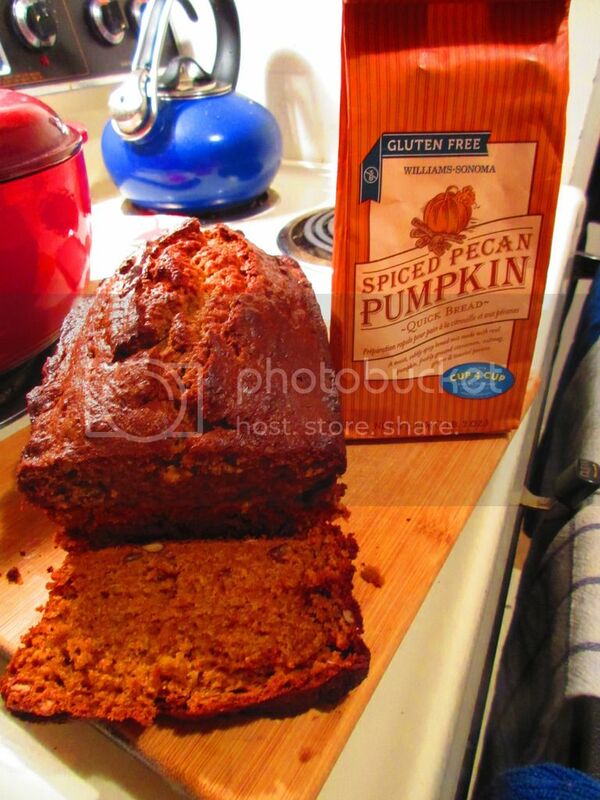 Let’s discuss the ingredients of the Williams-Sonoma Gluten Free Spiced Pecan Pumpkin Quick Bread. This mix is made from gluten free flour (cornstarch, white rice flour, brown rice flour, milk powder, tapioca flour, potato starch, xanthan gum), sugar, dried pumpkin flakes, unsalted pecans, buttermilk powder, korintje cinnamon powder, sodium bicarbonate, salt, nutmeg, and ginger. As far as nutrition goes, a serving of the Williams-Sonoma Gluten Free Spiced Pecan Pumpkin Quick Bread is 1/15 dry mix (34 grams) or 1 slice (48 grams) of the baked quick bread. There are about 15 servings per container. A serving of the mix will give you 130 calories, 2 grams of fat, 0 grams saturated fat, 0 grams trans fat, 0 mg cholesterol, 190 mg sodium, 28 grams carbohydrates, 1 gram fiber, 15 grams sugars, and 2 grams of protein. When prepared, the bread goes up in calories to 190 calories per slice, which isn’t bad for a sweet bread of sorts. The package also comes with instructions for a cream cheese icing…but I didn’t have all of the ingredients on hand…and I love it plain anyway. But the option is there! I was really impressed with how well this bread baked up, how moist and delicious it is. I love how it just tastes like fall. I was hooked in one bite. And now I can’t wait to try other seasonal gluten-free quick bread mixes from Williams-Sonoma…because they really won me over with the Gluten Free Spiced Pecan Pumpkin Quick Bread. I might have to go pick up another package before it disappears (and then not wait so long to make it this time!). You know, there is something that is so comforting about cereal. I grew up eating cereal as a child…and not just the frosted sugary type either. I was a huge fan of Cheerios and Corn Flakes and even Wheat, Corn, and Rice Chex. I loved it all. As I’ve gotten older, cereal has remained a staple in my morning routine. It’s easy for me to eat a bowl and then get ready for a run…and have the energy to get through it. 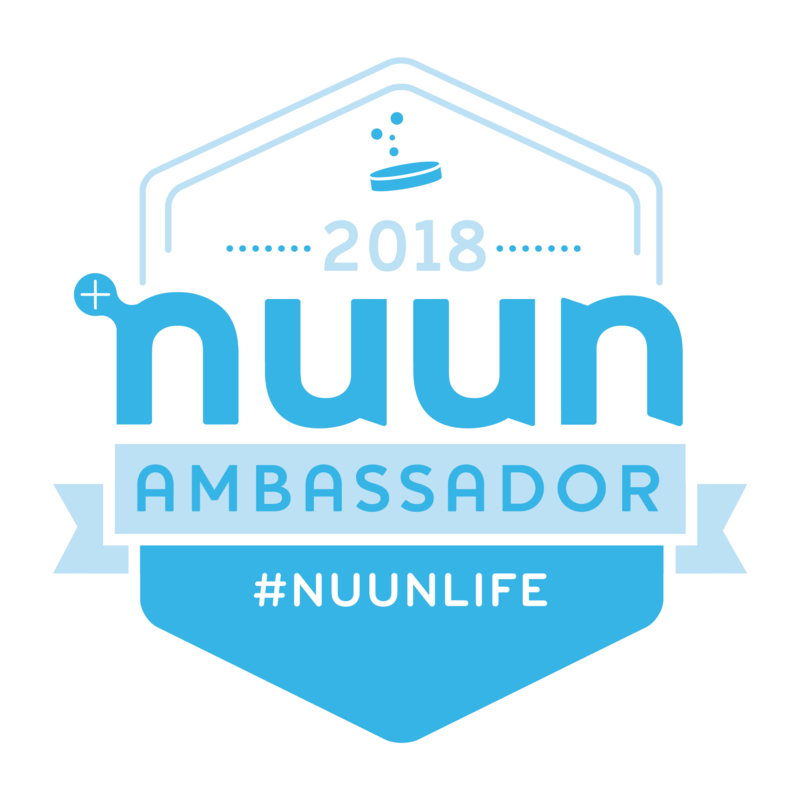 Some people run on empty stomachs in the morning, but my sports nutritionist and my own foray into the nutrition field, both have shown me why this is not such a good idea. As my sports nutritionist said…even if it’s just a handful of cereal or nuts or toast…eat something before you head out. Not a problem with me, because I LOVE breakfast. And one of my greatest breakfast loves is…as I mentioned above…cereal. I had recently stopped eating cereal, subbing in some fruit and yogurt instead. But…when something so unique comes along that you simply must have it…cereal is back in the bowl in the morning. And now part of me wonders why I stopped eating it in the first place. The cereal that changed my entire morning routine back to the way it was happens to be a product of Trader Joe’s. Trader Joe’s Pumpkin O’s. 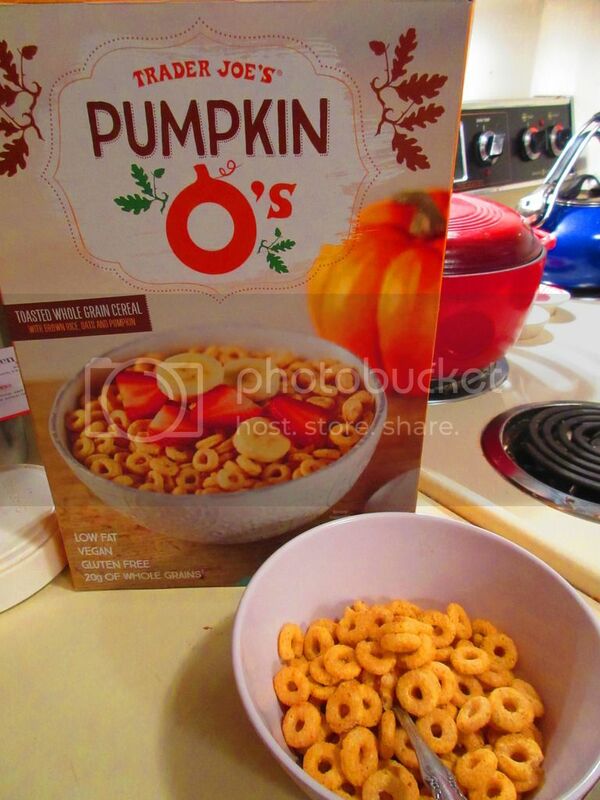 Yes…Pumpkin O’s. As in a Cheerio-like cereal flavored with mega pumpkin flavor. Oh, and they are about the size of Froot Loops (or the size Froot Loops used to be when they made them right…like…when I was a kid and all). So, like most great food stories, this one all started at the grocery store. I had only a small list of items to buy at Trader Joe’s. But the moment I walked in the door, I saw the big display of all the seasonal pumpkin everything everywhere stuff. I noted the cereal and let out a small sigh. Pumpkin cereal. Pumpkin O’s to be exact. Oh, to not be Celiac. But then, Cathy (the roomie) spotted the print in the corner. Low Fat. Vegn. Gluten Free. It was as though the pumpkin gods were smiling down upon me that day. Whatever I did right that day, thank you great cereal gods for watching out for my particular cereal wants/needs. Happy dance. Happy dance all the way up and down the aisles. Seriously…there was no stopping me. Trader Joe’s Pumpkin O’s are “round like pumpkins rounder, actually) and fun like jack o’lantenrs (maybe more fun, since you can eat them)” and are the sibling cereal to the Original Joe’s O’s. The box claims that the pumpkin wizards created this cereal with a stroke of their pumpkin-shaped wands, which are difficult and challenging to control) so this particular flavor of cereal will only be around for pumpkin season. So, if you’re a pumpkin nut-case like me…you best get to Trader Joe’s. This morning, with my Dole pineapple (also purchased at Trader Joe’s) gone…this was my breakfast of choice before hitting the gym. I measured out a serving, loving the size of the little round o’s. I snagged a few to taste dry from my bowl and crunched on them while I went to retrieve the unsweetened cashew milk. Into the bowl it went, giving the cereal a little lift. In went the spoon. Spoon went to mouth. Down the hatch. And holy Great Pumpkin, Charlie Brown! This cereal is amazing. If you’re a pumpkin lover like me, you’ll love this. Here’s why. This cereal is LOADED with pumpkin flavor. No skimping on that. No way. It’s crunchy, even in the cashew milk. And it tastes amazing. I was tempted to pour myself another bowl, but I opted to behave and stick to the serving recommendation. I had coffee and the gym to tackle. That being said, I sort of want to buy Trader Joe’s out of this cereal and just have it in my kitchen for all those mornings, not in pumpkin season, when I just want to have it be pumpkin season again. Let’s discuss the ingredients in Trader Joe’s Pumpkin O’s. This cereal is made from whole grain brown rice, cane sugar, whole grain oats, brown sugar, pumpkin, sea salt, natural flavor, calcium carbonate, sodium phosphate, cinnamon, annatto (color), mixed tocopherols (Vitamin E as an antioxidant for freshness). It is gluten-free, vegan, low in fat, and contains 20 grams of whole grains per serving. LOVE that. As for nutritional facts, the Trader Joe’s Pumpkin O’s actually stack up to be a healthier breakfast cereal choice than most commercial cereals. A serving is 1 cup (30 grams). This serving will provide 110 calories, 1 gram fat, 0 grams saturated fat, 0 grams trans fat, 0 mg cholesterol, 140 mg sodium, 25 grams carbohydrates, 1 gram fiber, 9 grams sugar, and 2 grams of protein. It’s not going to fill you up, but it will get you through the morning. Trader Joe’s did one better than most gluten-free cereals already out on the market. Trader Joe’s latched onto the pumpkin flavor craze…and it paid off in spades. If you have a Trader Joe’s in your area, go there…and get a box as soon as you can. The Pumpkin O’s will only be around for a limited time. And while this is a lot easier to come by when you don’t live in a bubble (aka: food allergies), it’s little things like non-dairy pumpkin spice flavoring in coffee…and my homemade (because no one else has made it yet) vegan pumpkin ice cream. And it’s Sweet Note Bagel Girls getting me all kinds of “OH HELL YES” with the return of their Gluten Free Pumpkin Spice Bagels. Seriously, these ladies are my new BFFs. OR…as they say on their Twitter account, GFFs (Gluten Free Friends). If they ever want to sponsor an athlete to endorse their stuff, I am their girl. Because when it comes to things that runners (and New Yorkers, mind you) love…it’s BAGELS! Especially this native New Yorker who just happens to be…a runner. 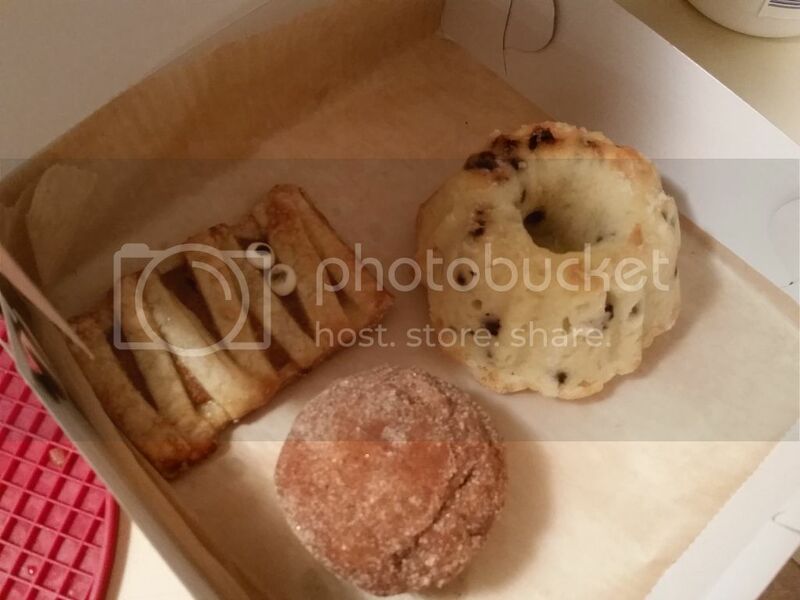 And while the gluten-free market has a good number of companies that have gluten-free bagels out…none have tasted like the actual real thing…until Sweet Note Bakery found me and enticed me to give them a try. They totally peaked my curiosity. So, without any further knowledge about their products, without looking up any reviews as to what other consumers thought of their products, I was on their online store, purchasing half of their bagel selections. Yep, I didn’t start with just one variety. I went into this believing that these would blow me away…and thus…I ordered four (4) of their eight (8) varieties that they offered at that time. To be clear, they normally have five (5) standards: Plain, Everything, Sesame, Poppy, and Cinnamon Raisin…and they add limited time goodies like Snickerdoodle (didn’t get to try that one, so I hope it makes a return appearance this holiday season), Chocolate Swirl, and yes…Pumpkin Spice. Sweet Note began in 2012, when founder and president, Michelle MacDonald, stepped up to a challenge. She had been baking ever since she was a child and was very passionate about it. When her grandfather and sister were diagnosed with Celiac Disease, she took the first steps on her entrepreneurial journey. Her family really missed a good New York Style bagel. (Hey…I can’t blame them…I know this feeling all too well). So with a lot of experimentation and trial and error, MacDonald perfected the recipe, getting huge approval from her family (also bagel lovers). Gluten-free bagels that taste good?! It was a reality. 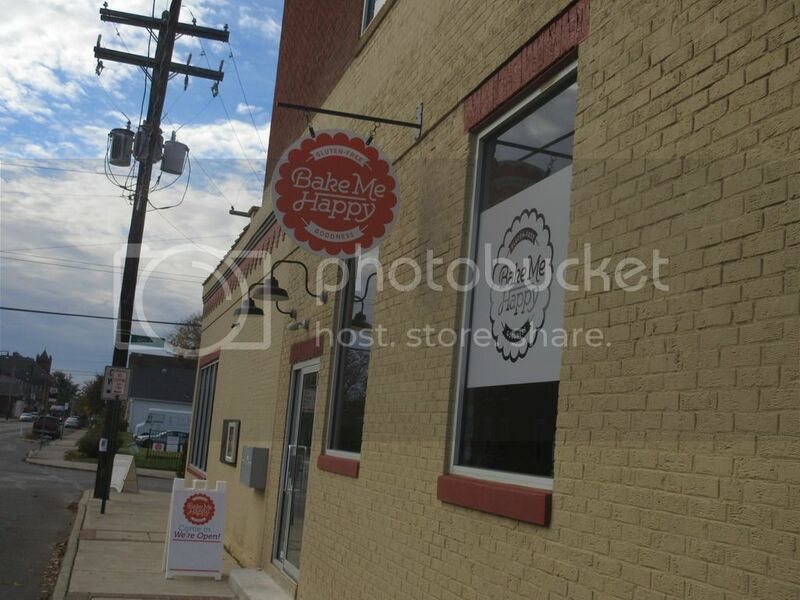 Sweet Note Bakery’s vision is to make gluten-free options more readily accessible. Those of us who live with Celiac understand how isolating this disease can be, when you can’t have a meal while out with friends and family, be it at a restaurant or a ballpark, or wherever your adventures take you. MacDonald wanted to change that…one gluten-free bagel at a time. This is truly a love story between me and these bagels. Every single flavor has been outstanding. No joke. You know, I’m very blunt about things I eat and if I don’t like them, you know it. There is nothing NOT to like about the bagels that Sweet Note Bakery puts out there. Fantastic quality…fantastic flavor. Never once have they let me down. And that’s why all other bagels stay in the freezer section now…and Sweet Note is the only one that actually makes the journey home to my own freezer. Now, let me be the first to admit…I am a pumpkin spice junkie…fanatic…enthusiast. I love all things pumpkin. So, when I discovered that they were bringing back Pumpkin Spice for a limited time to their bagel line-up…I treated myself to a birthday present and purchased a package of them. I was out of town a lot, so I’m just now getting to devour…I mean…taste them. But with things finally settling into a rhythm…I pulled these bad-boy bagels out of my freezer this morning to have for breakfast. I grabbed two of them (one for me and the other for my non-gluten-free roomie!) and got onto thawing them in the microwave. You don’t bring these to room temperature like most gluten-free foods. Just 1 minute or so in the microwave, until they are squishy soft, and you’re golden. Cool them for a moment, slice in half, and toast. 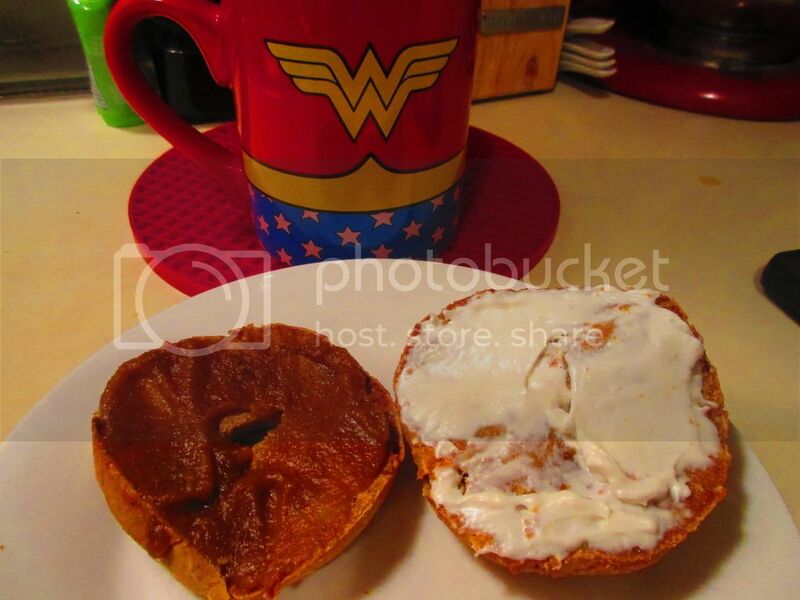 I will note, the Pumpkin Spice are special because you actually see flecks of orange pumpkin in the halved bagel itself. Love that. Because I don’t own a toaster, these bad boys went into the oven. They smelled amazing as they toasted away, getting to that perfect level of golden on top. Out they came, cooling for a moment…then I topped off one half with vegan cream cheese and the other half with organic pumpkin butter. I passed one plate off to my roommate and, after pouring myself a cup of coffee, I settled in to my own. Forget pumpkin spice lattes and pumpkin spice waffles and pumpkin spice oatmeal…or whatever might be out on the non-gluten-free market…that we don’t have. We have one better. 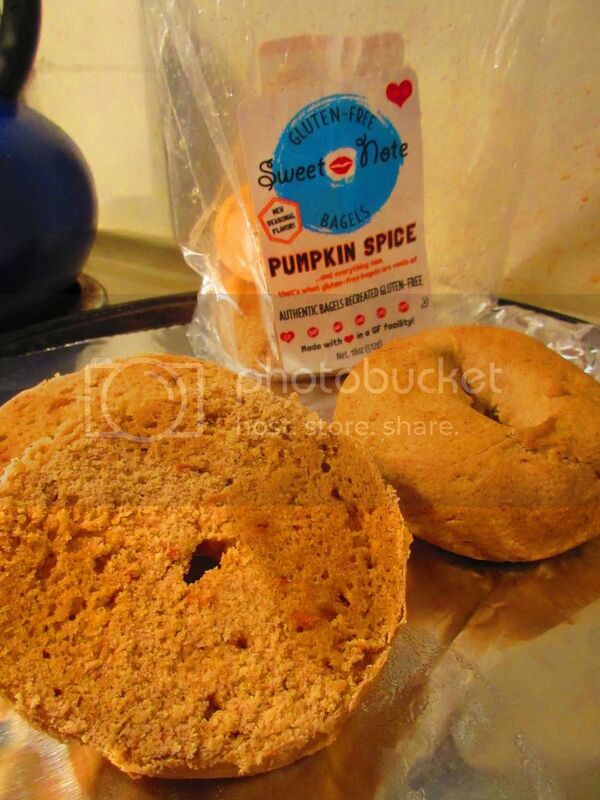 We have The Great Pumpkin of all things pumpkin spice: Sweet Note Bakery’s Gluten Free Pumpkin Spice Bagels. OH YEAH! Real…REAL New York-style bagels here…made from real ingredients and not all that processed…stuff. These bagels have to be filled with hocus-pocus, because they are, perhaps, one of the best things I have ever had for breakfast. The bagel itself is full of pumpkin flavor. No skimping there. And that’s important, when you bill yourself as a “pumpkin spice”…whatever. So often, that flavor goes missing…but not here. It is spooky how much flavor is packed into these dense, little bagels. The crust of the bagel was toasted and crisp…the inside…chewy and just…filled with pumpkin goodness. I was blown away. And, even as I told myself to savor each bite, I think I hoovered the bagel like it was candy. I’m thinking another order is happening in the very, very near future. So, let’s get down and talk about some of what goes into making the Sweet Note Gluten Free Pumpkin Spice Bagels. These bagels are made from Love (yes…an actual ingredient! ), Water, White Rice Flour, Tapioca Flour, Sweet White Rice Flour, Sorghum Flour, Sugar, Cane Syrup, Pumpkin, Carrots, Molasses, Yeast, Xanthan Gum, Psyllium Husk, Salt, Cinnamon, Vanilla Extract, Nutmeg, Cloves, Ginger. Note…all recognizable and real ingredients. These bagels are gluten-free, soy-free, egg-free, dairy-free, vegan, and non-GMO. As far as nutrition goes, you’ll love these stats like I love pumpkin! A serving size is 1 bagel (128 grams). This serving will give you 260 calories, 1 gram fat, 0 grams saturated fat, 0 grams trans fat, 0 mg cholesterol, 300 mg sodium, 62 grams carbohydrates, 3 grams fiber, 10 grams sugars, and 4 grams of protein. I said it before, and I’ll say it again, it’s amazing how much more filling a food is when it’s made with real ingredients. These bagels will definitely get you through your morning! What are gluten-free bagels made of? Pumpkin Spice and everything nice…if you’re talking about the return of Sweet Note’s Gluten Free Pumpkin Spice Bagel. And if you’re not, then you should be…so head over to their Web site and place an order. Don’t delay…these are only around for a limited time! And…if you haven’t already, you might as well order some of their standards while you’re on their page. I promise you…you’ll fall in love with these bagels too.